The San Andreas Fault is easy to follow through California. From the Salton Sea, it runs northwest 800 miles before ending under the Pacific Ocean. The San Andreas Fault is known as a transform fault, which is where two of the earth's plates meet. In this case, it's where the Pacific Plate and the North American Plate come together. Geologists divide the San Andreas Fault into three parts: the Southern San Andreas Fault, the Central San Andreas Fault, and the North San Andreas Fault. There are plenty of places to see each one. The San Andreas Fault begins near the Salton Sea, runs north along the San Bernardino Mountains, crosses Cajon Pass, and then runs along the San Gabriel Mountains east of Los Angeles. The mud pots near the Salton Sea are a result of its action, but your best bet to see the Southern San Andreas Fault is at Palm Springs. Near Palm Springs, the San Andreas Fault is less well defined than further north. The monolithic geological feature fractured into many smaller ones running in various directions. Underground fissures caused by the faults give underground water an easy route to the surface and are responsible for the many desert oases found along the east side of the Coachella Valley. You can see an oasis (and stand directly over the fault line) at 1000 Palms Canyon in the Coachella Valley Preserve in the town of Thousand Palms. All those little cracks also give rise to hot mineral springs. Most of them are located around the town of Desert Hot Springs. An even better way to get up close to the fault near Palm Springs is to take a jeep tour with a knowledgeable guide. Desert Adventures' San Andreas Fault Adventure will take you through the desert and into the canyons and oases along the fault, going right up to a spot where the Pacific and North American geological plates intersect. In the summertime, you can take the Nightwatch Adventure, which covers much of the same terrain and ends with a spectacular look at the evening sky. Situated between I-5 and U.S. Highway 101, the Carrizo Plain National Monument is one of California's least-visited sights, with many state residents unaware of its existence. Yet nearly everyone has seen the classic image of the San Andreas Fault taken from the air at Carrizo Plain. At Soda Lake, the fault runs just at the bottom of the hillside beyond the water. Geologists swoon over this bit of California geology. Besides the dramatic fault itself, a bird's-eye view reveals stream beds that have been offset by the fault's movement, hills torn apart in the middle, and sagging bits of the earth's surface. These features are subtle and harder to see on the ground. Nevertheless, the area is extraordinarily beautiful, especially during a good wildflower year in the spring and summer. The free, self-guided geologic tour brochure is available ​online or at the visitor's center, and it will help you get the most out of your visit. It includes a hike to a point atop the fault. The Carrizo Plain is closer to Los Angeles than to San Francisco, but you can visit it as part of a long day trip from either city. Carrizo Plain is very isolated with no place to get food, water, or gasoline for many miles in any direction. It's very hot and inhospitable in summer and the visitor's center is only open from the beginning of December to the end of May. And to top it all off, there's no cell phone reception in the area, either. It's up to you to be prepared. This area is also popular with birders and photographers. Following a rainy winter, wildflower displays are some of the state's best. Docents lead special tours to see them. The nearest lodging is along the major highways, but there is a campground. 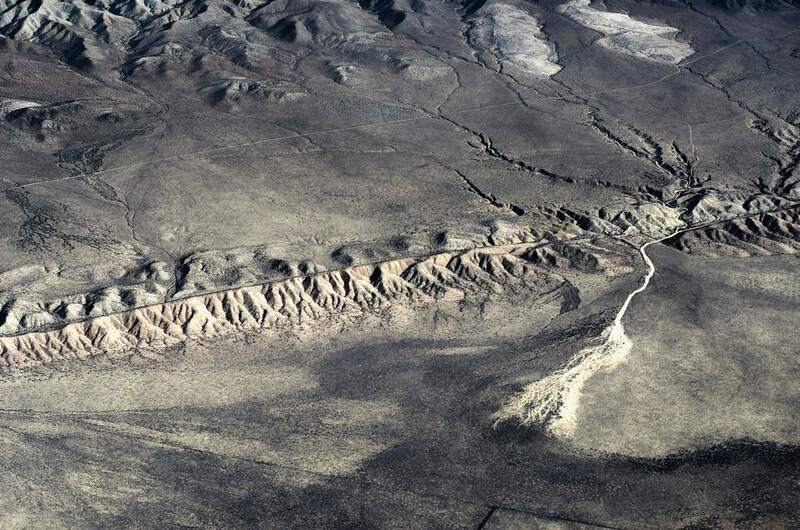 A bend in the San Andreas Fault north of Frazier Park creates an earthquake about every 150 years. In Parkfield, you can see the results in a bent bridge. Parkfield is fun to visit and is home to a deep well dug to explore the San Andreas Fault. This tiny town sits nearly atop the San Andreas Fault and became quite famous when the United States Geological Survey observed that it had experienced six earthquakes at roughly 22-year intervals between 1857 and 1966. Based on that data, another quake was predicted for the early 1990s. The Geological Survey installed instruments to record it and in 2004, they drilled the San Andreas Fault Observatory at depth, a hole almost two miles deep to get closer to the source of the movement. In the early 1990s, a sign at the local cafe said: "If you feel a quake or a shake, get under the table and eat your steak," but the 1990s came and went and interest waned. Finally, a magnitude 6.0 earthquake did occur on September 28, 2004. Parkfield is just barely on the east side of the fault. Since the first bridge was built there in 1936, the Pacific Plate has moved more than five feet relative to the North American Plate. The bridge has been rebuilt several times. This latest structure is built to slide atop concrete pillars as the fault predictably moves. Sources say the bend in the metal railing was not there when it was first constructed. In town, you'll find a cafe and a small inn that boasts: "Be here when it happens." You can see results of the San Andreas Fault's movement at Pinnacles National Park. Rocks found here hitched a ride from Los Angeles on the Pacific Plate and were deposited there. Because of unique rock formations found in only two places, they are believed to be part of the Neenach volcano that occurred 23 million years ago near present-day Lancaster, California. The San Andreas Fault ripped the old volcano in half and they have traveled some 195 miles to reach their present location. In San Juan Bautista, you will find an old Spanish mission that sits just above the San Andreas Fault. The old Spanish mission at San Juan Bautista sits just next to a small escarpment, and if you did not know better, you probably would not realize that the San Andreas Fault caused the little uplift in the earth's crust. A historic marker and geological exhibit call attention to what lies below the plowed field nearby. Surprisingly, the old adobe-brick Spanish mission building has been used continuously since 1812 and has never been toppled by an earthquake. However, in October 1798, the shaking was so bad that the missionaries slept outside for the whole month. There were as many as six tremors in one day, making huge cracks in buildings and in the ground. The fault continues through the Santa Cruz Mountains, which was the epicenter of the 1989 Loma Prieta earthquake up the San Francisco Peninsula, where you can take a little hike to see along it at Los Trancos Open Space Preserve. On the peninsula south of San Francisco and near Palo Alto in the Los Trancos Open Space Preserve, you can take a mile-long, self-guided hike that runs over the San Andreas Fault. It's an easy walk through some pleasant terrain. The fault's features are subtle in this area: depressions that look like road beds, shallow sag ponds, and gullies running the wrong way. You can download the self-guided trail guide. The fault turns offshore near Mussel Rock, the epicenter of the 1906 San Francisco earthquake. Several spots in San Francisco are reminders of that event. It comes back onshore north of Stinson Beach, goes underwater beneath Tomales Bay, and crosses Point Reyes. It comes onshore near Fort Ross, goes out to sea near Point Arena, runs up to Cape Mendocino, bends west, and finally ends. By far the most famous victim of the San Andreas Fault was San Francisco, which was rocked by two big earthquakes in 1906 and 1989. The bigger and more destructive of the two was the temblor which occurred at 5:12 a.m. on Wednesday, April 18, 1906. With an estimated magnitude of approximately 8 on the Richter scale, it was almost 10 times larger than the 7.1 magnitude quake in 1989. Centered about two miles offshore, it ruptured the San Andreas Fault for almost 300 miles and was felt from Oregon to Los Angeles. Devastating fires sprung up in its aftermath. More than 3,000 people died, which was the greatest loss of life from a natural disaster in California's history. The statistics are eye-popping: 300,000 people were homeless out of 410,000. About 25,000 buildings were destroyed, and there was $400 million in losses (an equivalent to $5.67 billion in 2009 dollars). Surprisingly, the city got back on its feet in just a few years, in time to host the 1915 Panama-Pacific International Exposition. Today, few landmarks remain where you can see evidence of the 1906 quake. The 1906 earthquake caused more damage in San Francisco, but near Point Reyes, it generated the largest surface displacement ever recorded from an earthquake: 21 feet. More gradual movement along the fault moves the Point Reyes peninsula a little further north each year, separating it further from the Tehachapi Mountains, which are now 310 miles further than where it was once attached. This map shows the San Andreas Fault as it runs through the state of California. You can also find an interactive version of the map.